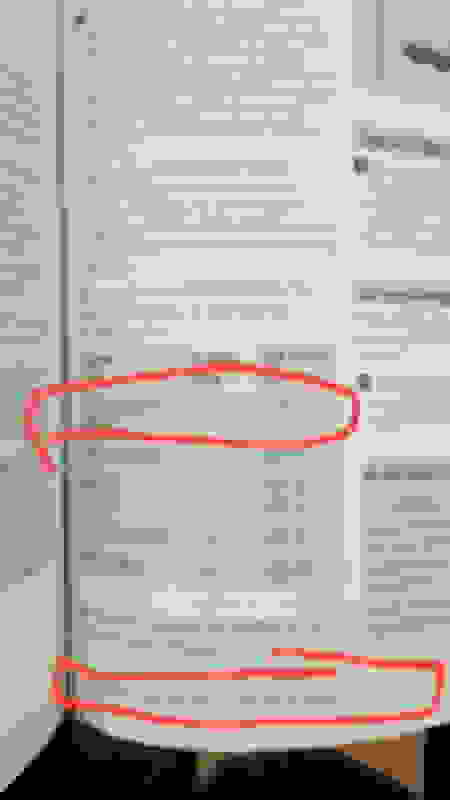 Anything oil wise is outdated in your manual. There have been many many revisions for oil for diesel models. Any 229.52 or 229.51 oil will be fine. It's about the spec, not the weight. Going into summer you would the 5w40 or 5w30. 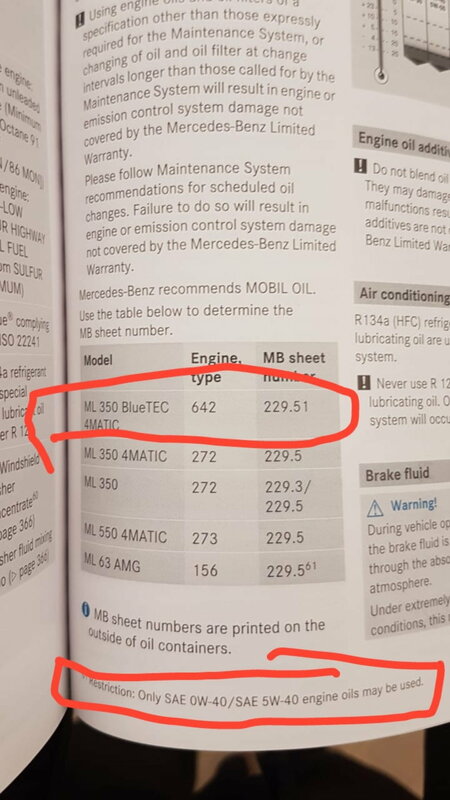 The reason mb has 5w30 for 229.52 is because diesel gets into the crankcase oil and affects the lubriciity properties of the oil, essentially cutting it. With the old 0w40 oil any diesel in the oil made it essentially useless as oil under the xntended oil intervals. The switch to thicker 5w30 oil was meant to fix that. I live in warm area 40°C here in summer is 5w30 good by ur opinion ? P.s. I see from your posts youre having issues with you heating element. If you are in the US these are the least of your issues. I highly recommend a tune to tune out the diesel emissions to keep your vehicle reliable. Also a full engine flush and ceratec coating to get rid of any crud, dropping your belly pans and 5k mi oil changes to get rid of any sludge that might have accumulated. If you're serious about oil getting hhe upgraded aftermaket spin on oil filter adaptor will help against some of the problems too. And happy reading. This should be mandatory reading. Last edited by kombifan; 03-14-2019 at 09:11 AM. I heard in eu there are no strong regulations about bluetec and there are some workshops that can turn it of at all do you think that would be a wise thing to do ? You're going to be in a lot of trouble if you don't. Usa diesel cars are hampered by stringent emissions requirements that ruined the engines that eu diesels didn't have. Us mb diesels got sludge, extreme heat soak melting mounts seals and everything that could go wrong that euro mb diesels didn't. I hear good things from green diesel engineering or something like that. If you want mb oil 229.51 it will be fine, just do 10k km oil changes since you have a us diesel. Last edited by kombifan; 03-14-2019 at 09:18 AM. For a gasoline car you would want something else. But because the diesel has issues with hhe fuel washing into the oil, diluting it and making the oil thinner you want 5w30 to stop it. As you can see everything is 5w30 except for shell which also has 0w30. And the 1 manufacturer who has 0w40 is mobil 1. Stay away from it! Last edited by kombifan; 03-14-2019 at 09:27 AM. Btw have u ever had a catch tank installed ? Eu 642 diesels didn't have those issues. In the family we've had 5-6 of the eu 642 without major issues really. The US ones are riddled with probl ms.
Last edited by kombifan; 03-14-2019 at 12:25 PM. Ooof. I don't know about that. I would ask the owners in the diesel forum who've had the tune done. Last edited by Riki986; 03-14-2019 at 01:53 PM. Specification 229.51 is essentially obsolete and is replaced by 229.52. This is a fuel economy measure, as by definition .52 is 30W. W30 should be okay ? if you had yourMercedes dealer change your oil,that’s what they would use because that’s all they have. 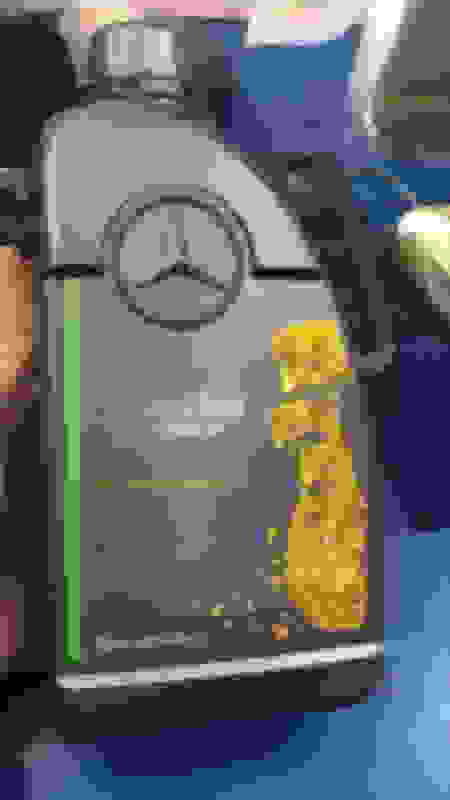 Mercedessays it’s ok.